Keeping on rolling out at least one picture per chapter of Smirking: A Grot's Life and this time we're hitting chapter 8. This is the scene shortly before the big gun on the tank goes boom. I had to completely redraw the tank at one point because the scale was way off. It looked like some sort of RC Leman Russ Scale model coming round the corner to shoot Nerf darts at them. You could probably kill a grot with a Nerf dart though. Anyway, a quaint country courtyard gets the (not) grimdark treatment as another grot bites the dust. Smirking looks a bit "come hither" in this pose. I had originally planned on having them both just standing on the mat. Sometimes the actual details from the story just go and ruin your picture idea. Accuracy... pfff. Another chapter another silly moment in the life of our favourite little guy. Smirking takes refuge atop a large rock as the trukks of Waaagh GorGoff go rolling by singing "'Ere we go, 'Ere we go, 'Ere we go!" Aw... Remember when orks were mostly daft and had comedy written into every bit of fluff? I mean, that's firmly the world that Smirking inhabits. Was it all Jervis Johnston? It was all good, that's all I know. I liked the Gorka Morka era of orks - fun but kind of gritty also in terms of the details of their life. Just like your stuff! Now it is all super grim. I like your characters because they are brimming with personality, and because they exist in a world that could actually function! Too often the orks are only this mindless ravening horde in the fiction, in a setting that's already filled to bursting with mindless ravening hordes. Can't remember where I saw it but someone did a brilliant piece of artwork that displayed this perfectly. On one side it had a familiar gritty piece of artwork of an Ork charging a desperate Guardsman. On the other side it had the same scene written from the Ork's perspective which was basically a badly drawn cartoon with the Ork shouting something entertaining and a comical-looking Guardsman. Thanks guys. Good to know I'm not alone in my appreciation of the lighter side of 40k orks. The plan to draw at least one scene from every chapter of Smirking continues with this picture. Smirking (he's the tiny grot way in the distance) and friends find themselves in a minefield. I enjoyed the cartoony truck full of little grot faces. Didn't enjoy the landscape so much, but ho hum, here it is. I think I enjoy big close up portraits or little character sketches best. Just one more chapter still to illustrate but there are a few more iconic scenes I'd also like to draw before I'm done illustrating my original story. Yes, all those little heads poking out is a nice detail. Haha neat I do like the Grot clown-car. Seems exactly how they'd travel around. Not a chapter that needed a picture as Chapter 3 already has one but more of an iconic moment that deserved drawing. GrodMek and SnazzGuts hatch their KillaKan plan while Smirking hides inside. Not entirely convinced with my portrayal of GrodMek here. He looks more Borg than Mek but not to worry, I like the picture as a whole. Only trouble is the last chapter I have to draw is all about GrodMek. I'm not looking forward to it, no good ideas. Expect much procrastination to follow. Having read the story, (brilliant), and seen the artwork, I'd really like to think that this is how orks see life, no matter how awful the reality, to them it's a vivid cartoon filled with fun and humour and if something bad happens, they just enjoy a little bit of revenge and the merriment continues. Orks would be Ryan Reynolds in the movie "The Voices" when he's not on his medication. Show me your god and I'll send you a warhead because my god's bigger than your god. I like that the Orkish ecology/economy kind of works as you describe it. There should be more Grot Cars and more Grot fluff! Keep it up. Thank you both. I'm glad my madness is making sense to people. Maybe we're all a bit mad though. Anyway, onto the next doodle. Kinda giving the game away early over on Give it yer best Grot! with this one as the story hasn't quite caught up to this happening yet. Really makes me want to grab some minis and scratch build a grot big shoota wheelbarrow assault team. Someone please do this!
. He's a straight up Kommando Grot. Kinda a small little character sketch more than a full A5 scene. 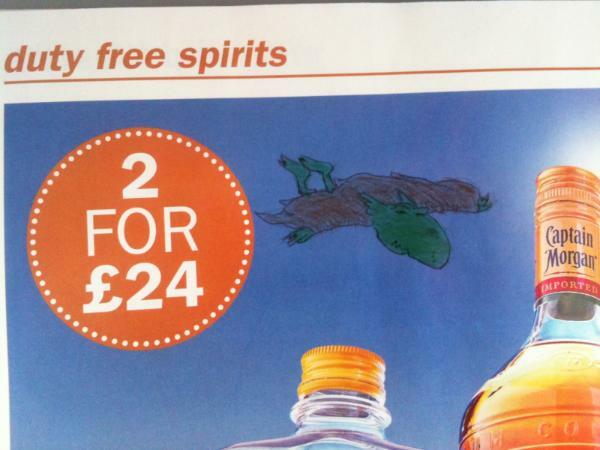 Its actually drawn on the rest of the same page as the above wheelbarrow picture. Haha nice! Love the wheelbarrow assault weapon definite conversion potential there. Man if i had a little wheelbarrow of some kind i would try to make that setup. In this one SkagNet is busy being nasty. I've drawn him plenty of times bumbling around in his usual mode (abject failure) but rarely doing any proper bossing around of grots. Not sure who the little guy is. Not sure SkagNet knows, or really cares much. And another picture, this time it's KommissarKiln's grot duo, Pokey and Snot-fer-Brainz from Give it yer Best Grot! I hadn't done any big close studies of grots yet, all my close ups had been orks to date so I took the oportunty to do these two nice and close and big. Turned out alright, bit tricky getting the grots' noses right when they're facing you. I do so many of my big-nosed grots in profile because its so much easier. Sitting drawing with the kids i picked up some of their colouring pencils and this guy popped out onto the page. Smirking is back baby! So then things got a bit more serious. The first time I've drawn a version of Sleekit aka. "The Grotfather" that i'm actually really happy about. So that was it. I'm back to drawing like a man posessed. Grabbaed a postit note pad at work and sketched out this little guy. Smirking Da Chosen One. Coloured with watered down acrylics. very happy with the result. Lot's more to follow soon. Thanks for looking. I'll drop another couple quickly too. Cause I've been dead busy. Just a wee drawing of Nurd, the book 2 incarnation of Nurd sees him less of a smart arse fixer grot and more of a gobby know-it all from a grot bomba crew. Thought I'd try out some alternative colouring methods. Grabbed the kids' crayons for this one. Then this is one for my last un-illustrated chapter of book one, which now has at least one picture on every chapter. I still want to draw Smirking in the very final scene though, but that hasn't happened yet. This is GrodMek of Book 1 preparing to dish out the Dakka. More to come soon, and thanks for looking. I am very glad to see these little guys back, your art always gets me in a good mood. I love the grotfather's expression. Thanks AT. Glad I could brighten your day. The big cheese of the Morka-Wing and Kaptain of Da BizMork, the Morka-Wing's largest and fastest aircraft carrier. Another painted postit for another pretty successful portrait. We're going to be seeing a lot of this fella. Going on holiday for a week so I'll drop a good few pictures before I go. Ok, so telling the story of Aaris Da Butcha in a few pictures. Here's Aaris laughing it up as Smirking outsmarts GrodMek like a total Grot boss. Aaris takes Smirking for a flight on his big red bomba. But things get nasty and he takes our hero on, not realising that Smirking is not exactly, alone... Its a long story. Now look who's joined the party. That's all for the big fella in the coat and hat. Quite enjoyed drawing him, but I don't think he'll feature much in my future drawings. Still you never know. As ever folks, thanks for visiting my grot-life sketchbook. Well I'm back. Had a great holiday, thanks. 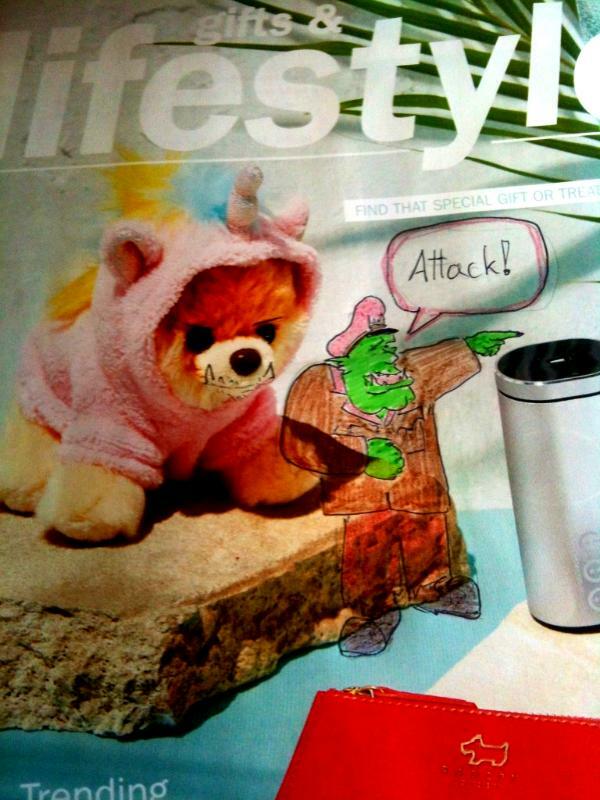 Knocked out a couple of doodles on the inflight magazine. And Aaris commands his cute plushy Squig-icorn to attack. Or about as serious as a bunch of grots partying around the campfire of the revolution can be. WazzBad's Dakka-jet gets bounced by some human fliers outa nowhere. The Dakka-jet designs on display here were inspired by Buttery Commissar's own Dakka-Jets which are some of the first kit-bashes on his rightly legendary blog. Buttery, wherever you've been these days, hope you're doing well. That's all for grot-life for now. Might get back to painting my planes again so no more drawings likely in the near future. But you never know. And wrapping things up here for now it's the last picture in my original Grot fiction The Adventures of Smirking: A Grot's life. At this point there's little danger of spoiling the ending cause lets face it, I've been shamelessly promoting this story on Dakka for years and if you haven't read it by now you're not likely to. (Though I still think you should) This right here is the final scene, where Smirking strides off, triumphant, into the moonlight. So that's all for my Smirking Book 1 illustrations. Thanks to everyone whose encouragement helped me complete a long term project goal. Smirking Da Chosen One Many illustrations for which were seen here first. As a story it's a slightly different format this time around. Shorter chapters but many more of them, though not all of which have illustrations just yet. Only four chapters posted so far but lots more are drafted. Its a very different world this time around but if you enjoyed "A Grot's Life" I really think you'll enjoy "Smirking Da Chosen One" too. I've no more pictures in the pipeline just now but if I get the bug again I'll be back on here. Not hanging up my drawing skates just yet. Thanks again to everyone who's commented and shared my enthusiasm for daft grot fiction inspired illustration. I'm so glad I got to see this.